GS1 are a non profit-making organisation that administer worldwide standard format Global Trade Identifications Numbers (GTIN’s). When you apply to GS1, you will be issued with 1,000 to 100,000 unique barcodes (depending on your turnover). They will be sent to you in the form of a spreadsheet. Ideally you should allocate the GS1 barcodes to your SAGE Products, update the spreadsheet and return it to GS1 who will update their database. What do I need to do with the GS1 Codes? As we have seen, GS1 will issue you with 1,000 – 100,000 unique codes which you will assign to your Product records in SAGE 50. 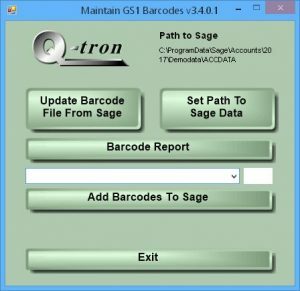 You will need to enter the GS1 Code into the SAGE Barcode field and then write the SAGE Product Code into the GS1 file. Depending on the number of Products, this could be a very time-consuming task! Q-GS1 is a database which links to SAGE and manages the allocation of EAN or UPC barcodes to Product Codes. It automatically picks up previously allocated barcodes from the ‘Barcode’ field on the SAGE Stock Record and then assigns the unallocated GS1 codes. When you run Q-GS1 for the first time it will ask you to enter the name and location the file containing the GS1 Codes. You select a Product Category and press the ‘Add Barcodes To Sage’ button. The program will search for all Products in the given Category that currently do not have an entry in the Barcode field. The program will find the appropriate number of previously unallocated GS1 Codes, update the SAGE records and then add the SAGE Product Codes to the GS1 file. You will do this for each Product Category. N.B. If you have Products that do not require a Barcode then these should be in a specific Product Category. If you make any manual adjustments directly into SAGE (e.g. 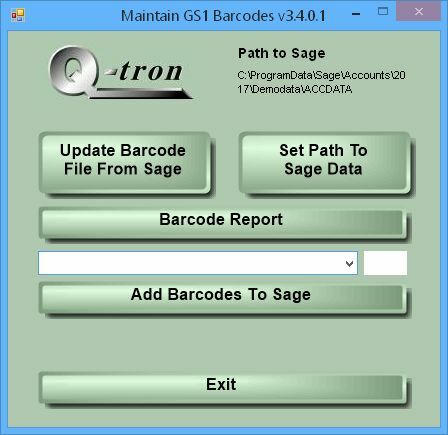 switch GS1 codes between Products) you can press the ‘Update Barcode File From Sage’ button. If you would like a hard copy of the GS1 details you can press ‘Barcode Report’.